Zapier today added support for Alfred, one of the most popular productivity apps for macOS. Alfred is like a supercharged version of macOS’s built-in Spotlight; it enables you to quickly, easily search for files, webpages, or apps, perform text expansion, control music playback, and much more. Despite Alfred’s already extensive capabilities, Zapier support opens up a world of new possibilities. Zapier is an automation web service that we use and love here at MacStories. Its power is found in integrating with a substantial number of web-powered services that can be hooked together to automate tasks in all sorts of ways. Zapier’s support for Alfred means that access to that extensive catalog of web-based services and tools is now at the fingertips of Alfred users, making tasks of varying complexity levels possible with a few simple keystrokes. In Zapier’s announcement post, Matthew Guay walks through how to get Zapier set up with Alfred, and he also shares several examples of workflows now made possible thanks to today’s news. Very nice addition to Alfred for Mac released today: Alfred Remote lets you control Alfred and even trigger workflows from an iOS device. I've been testing the app and, while not for me (I work on my iOS devices), I think it's a great solution for those who get work done at a Mac and wouldn't mind keeping an iPhone or iPad next to it to offload some shortcuts. The app is easy to use, with large touch targets and a page-based UI to organize and launch shortcuts. Besides files and folders, I like how you can trigger workflows from an iPhone – nice, say, to wake up in the morning and prepare your Mac for work before you sit down. Now this is where things get really fun! Add a “Remote Trigger” to a workflow to allow you to launch it from your Remote. A single tap can launch multiple things; For example the “Morning tasks” action launches all of my essential websites and apps to start the day at once. Alfred Remote is $4.99 on the App Store and requires Alfred 2.6 for Mac. Yesterday, I wrote about CloudyTabs, a free Mac app that lets you open iCloud tabs from the OS X menu bar instead of Safari. Kevin Marchand pointed me to his iCloudTabs project, which allows you to view iCloud tabs from other devices using Alfred on the Mac. You can view tabs, open all tabs at once, and even write the URLs of all tabs to a Markdown file on the desktop. It's a neat idea and available on GitHub. I was really excited when Apple announced to add tag support to Finder with OS X 10.9 Mavericks. But after installing the OS update and playing with the new tag feature, I was a bit disappointed on how the feature was implemented. There was neither a command line utility to manage tags nor was there a way to do this with AppleScript. – At least, I did not find a proper solution. So, to add/remove tags to/from a file or folder one had to open the info dialog (⌘+I) and modify the tags in the new input field at the top. Good work by Marko Kästner. Mavericks' Finder can be slow at searching or adding tags for power users; Marko's workflow is nicely integrated with Alfred and it can be activated with a keyboard shortcut. 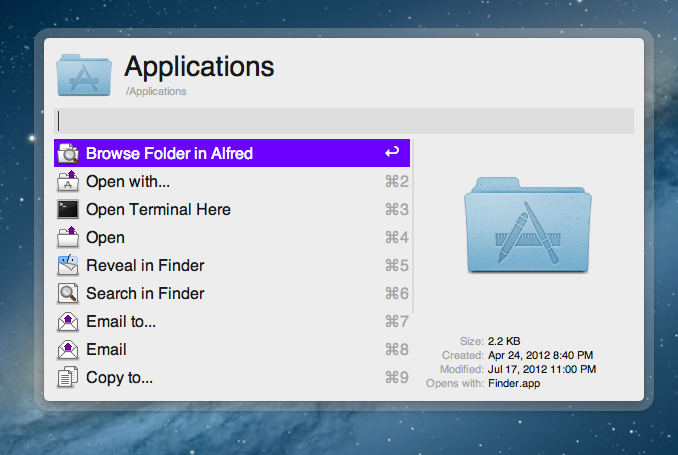 Alfred is one of the few apps that I can honestly say have changed the way I use my Mac. I remember the first time I downloaded Alfred back in 2010, the 0.4.1 beta had just been released. I was frustrated with the complexities of Quicksilver and wanted to try something different so I downloaded that early version of Alfred. I remember thinking it was nice, had a small handful of useful features, but ultimately I got bored and deleted it. I hadn’t even given the app another thought until Apple launched the Mac App Store and Alfred was one of the apps to be initially available in the store. I downloaded the free version and not even a week later I had purchased the PowerPack. I lost countless hours of my life scripting extensions to do anything and everything. Over the next 2 years the app received incremental upgrades adding new features with each release. This led to an overwhelming and hard to navigate labyrinth of settings and preferences. Alfred 2 doesn’t feel like an incremental upgrade to the original app. I think it could be better described as a fresh start. Rebuilt from the ground up, Alfred 2 sports a more logical preference structure that has been simplified for easy navigation without losing any features from version 1. Most notably, the developers replaced extensions with more powerful workflows. The user interface is larger, cleaner, and has new Retina-ready icons. Released yesterday, Alfred 1.3 is a major update to the popular desktop application aimed at "increasing your productivity" on OS X. Started as a simpler app launcher, Alfred has, in fact, evolved into a much more powerful -- yet always accessible -- solution that goes beyond the simple definition of a "launcher", like Spotlight would be. I use Alfred on a daily basis to browse my file system, compose email messages, search the web and even look for my favorite songs on Rdio. Alfred was once a launcher, now it's much more. In my workflow, it's an app that makes the core features of OS X work better for me. I particularly appreciate the improvements brought in version 1.3 as they address a usage scenario I often find myself dabbling into: selecting multiple files in the Finder to move them to another location. For instance, in writing my Mountain Lion review, I took a lot of screenshots; those images had to be cropped, resized, and re-composed to fit the layout of my article. Once edited, I had to move them from the Desktop -- where OS X creates my screenshots -- to a sub-folder in Dropbox, which, through a custom script, they are uploaded to our CDN, returning a URL. With Alfred's new File Buffer functionality I saved precious minutes I would have otherwise spent opening the Finder and navigating with the trackpad. The File Buffer is basically a virtual "shelf" that can temporarily host files you want to act on. Configurable in Alfred's Preferences, you can set the Buffer to be cleared after actioning items, or after five minutes if items you selected haven't been used. 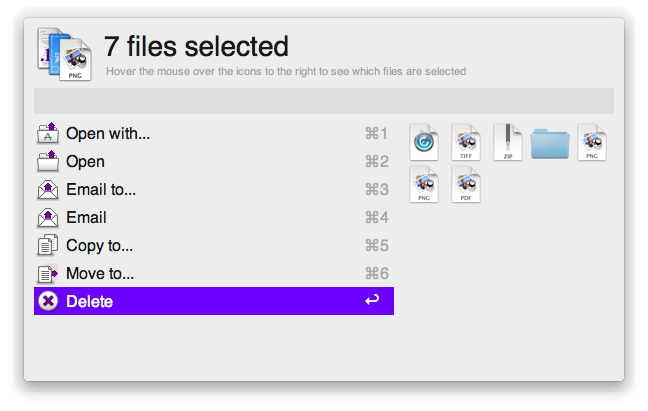 File selection is integrated with Alfred's existing navigation capabilities. In Alfred, you can browse your Mac's file system with the keyboard, finding documents and folders you need and choosing from a set of actions to do stuff with them. These actions include, by default, an Open command, Reveal in Finder, Copy Path, Move, Copy, and more; they are entirely actionable with the keyboard, so you'll be able to, say, unzip a folder and forward its contents via email to a contact without lifting a finger from the keyboard. Furthermore, you can assign favorite locations -- in my case, Desktop and Dropbox -- to a hotkey, and tell Alfred to open them in its own navigation, rather than the Finder's. 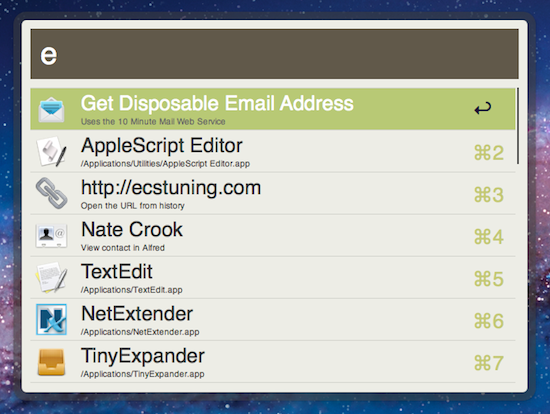 With the Buffer, you can now select multiple files and act on them at once. So while writing, I was able to bring up the Desktop in Alfred, select multiple screenshots, move them to Dropbox, then launch the .txt file where image URLs get appended to. The Buffer was a huge timesaver, and, for the future, I hope Alfred will make it easier to create custom actions (right now, here's how you can do it) and specify custom locations for the Copy and Move commands (you can type a folder's name to instantly bring it up). When working with the File Buffer, I often select images that I want to move or delete. Alfred's navigation window features a thumbnail preview for files, but sometimes that's too small to really see whether or not I've selected the right file. Thankfully, version 1.3 introduces support for Quick Look through the Shift key or by hitting Command-Y on a selected file. Quick Look works both in default results and the File System navigation. Version 1.3 brings many other features, improvements, and fixes as well. There is now better integration with 1Password, a new way to show more results, a compact mode, and a "quit all" command to quit all running apps. Make sure to check out the full change log for a complete list of changes. Alfred has become an essential piece of software in my daily workflow, and I'm glad I decided to give it a chance two years ago. You can download version 1.3 from Alfred's website, and unlock all the app's functionalities by purchasing the Powerpack. Alfred – the productivity tool for Mac OS X that started off as a simple application launcher -- has now evolved in to a tool that has literally changed the way so many people now use their computers. The team at Running With Crayons has been hard at work preparing the next release of Alfred, and today they are happy to make version 1.2 available to everyone. It has taken months of hard work, but their software development team has managed to integrate some outstanding new features and general improvements in both the free Mac App Store version as well as the Powerpack version available on their website. Without a doubt, the single greatest feature added to the latest version of Alfred is one reserved exclusively for paid Powerpack customers which gives users access to the their 1Password 1Click Bookmarks. There has already been a lot of buzz around the web after the developer preview of this feature rolled out, but to see it in action is truly amazing. 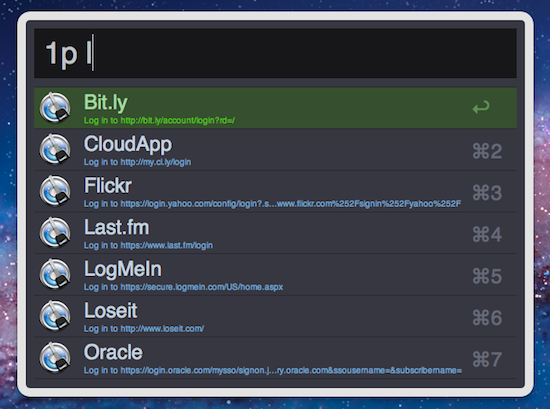 There is very little to configure and Alfred will attempt to find your 1Password keychain, then store your bookmarks automatically. I was quite impressed because my 1Password keychain is in an obscure spot in my Dropbox folder; however, Alfred had no troubles finding it and accessing my bookmarks. From there, it is a simple command ‘1p’ to begin searching the 1Click bookmarks. In typical Alfred fashion, it searches as much of the criteria as possible including the name and URL of the bookmark to ensure it finds the right one. I am certain that this feature was a popular request among users, and I love when developers take the time to not only listen to what their customers have to say, but actually deliver updates that reflect that actual desires of those using the software. In both the paid and the free MAS version, Alfred 1.2 has brought tremendous improvements to the matching algorithm it uses to find files as the developer noted on his blog last week. Sometimes these performance enhancements are hard to visualize when you actually get your hands on the software, but I am confident you will see improved search results in this latest version. Let me tell you a quick story to illustrate just how great the matching algorithm is in version 1.2. One of my fellow MacStories writers had sent me an iMessage consisting of only a quote that, judging by his continued conversation, it was one he expected me to be familiar with, yet I had no idea. I copied the text from Messages and pasted it in to Alfred intending to search Google in hopes of finding out whom he was quoting. Before I could hit enter, Alfred had found that quote inside a PDF that my fellow constituent had dropped in our shared Dropbox folder. I had no idea this file was even on my computer let alone the quote he had sent was apart of its contents. In the time it took me to type Command+V and hit Enter, Alfred had found the file and opened it for me. Expecting Safari to open with a Google search completed, it took a few seconds for my brain to comprehend what had just happened. Alfred knew exactly what I was searching for despite the fact I had no idea. That is great software. 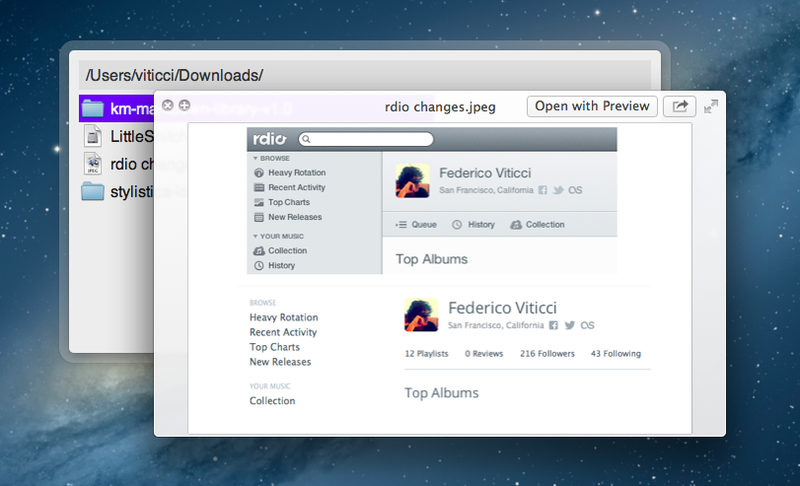 Other new features in both the paid and free versions of Alfred include two new themes as well as large type support. The two new themes called “Dark and Smooth” and “Pistachio” are a couple of great looking themes that were created by actual Alfred users and then voted on for a the opportunity to become default themes in the application. There are more details about these new themes available on the Alfred website. Now, not every new feature is going to appeal to everyone. This Large Type support was apparently highly requested among users but I have yet to find a reasonable use for it in my day to day workflow. The basics of this feature are as such -- you type any bit of text in to Alfred and then hit Command+L. Alfred will then fill the screen with that text in an extremely large font. According to the release notes, this is great for phone numbers and email address; I have only found it useful for showing dirty words to my wife from across the living room. I also wanted to briefly mention some of the improvements on Global Hotkeys because it was partly a request of mine. 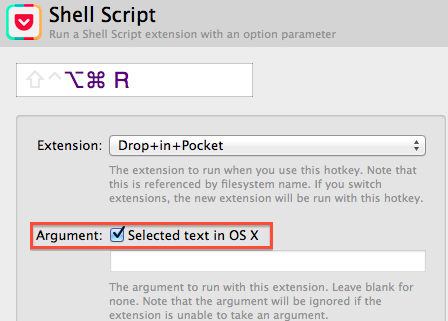 Powerpack users will find a new check box option under Global Hotkey extensions that will allow any selected text to be passed to an extension when the Global Hotkey is triggered. It is hard to comprehend the usability added by this one small feature through simply reading about it so be sure to also check out David Ferguson’s video on how to use the new feature as he also demonstrates his “Drop in Pocket” extension. Also added to Global Hotkeys was the option to paste the latest history item as plain text and the ability to assign a Global Hotkey to a text snippet. I have already started using the latter to manage my different email signatures with single keystrokes. As with most general releases of Alfred, these are not the only new features and improvements, but they are some of my favorites. The release notes are quite exhaustive and contain all the additions in great detail. If you have the Mac App Store version then there is an update waiting you in the App Store so go ahead and grab it. If you have the Powerpack version then be even more excited because you also have an update waiting, but with even more awesome features! 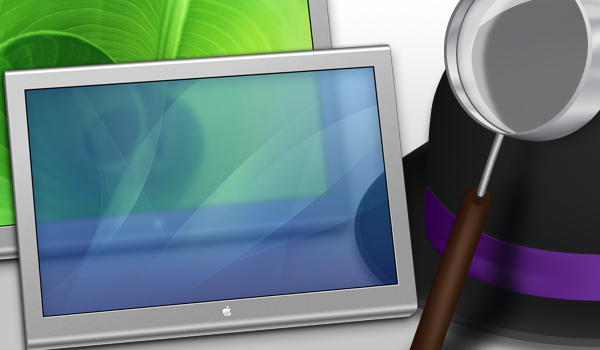 Screen Sharing is a feature built into Mac OS X for remotely controlling another computer through the use of virtual network computing (VNC). Apple’s native screen sharing client is buried in the operating system making it nearly impossible to find the app when you actually need it. On top of that, it really lacks basic features like being able to store a connection for future use. Due to these shortcomings, most people turn to third party applications for managing their VNC connections. 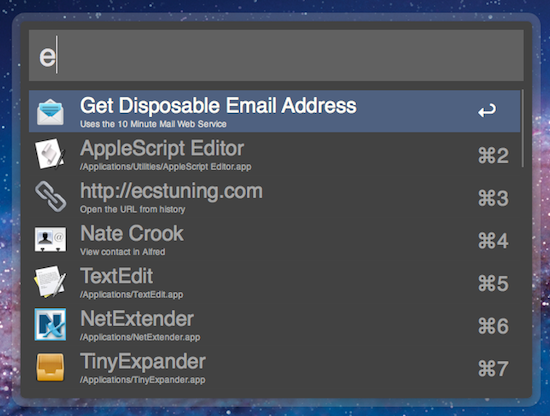 A quick search in the Mac App Store will turn up some pretty great options including Edovia’s Screens. Although apps like these work extremely well, not everyone wants to spend that much to easily connect to a remote computer. This is why I created the Screen Sharing for Alfred extension. I wanted Alfred to be able to function as my VNC client and really extend the functionality of the Apple’s native Screen Sharing app.